GENEVA, Switzerland -- The Anglican Communion is not the only worldwide Christian fraternity to have organised a tense, top-level meeting this month. Only a couple of weeks after the Communion preserved its shaky unity by ostracising its liberal American brethren, the leaders of the Orthodox Christian church convened in all their robed solemnity, and at rather short notice, in Geneva. 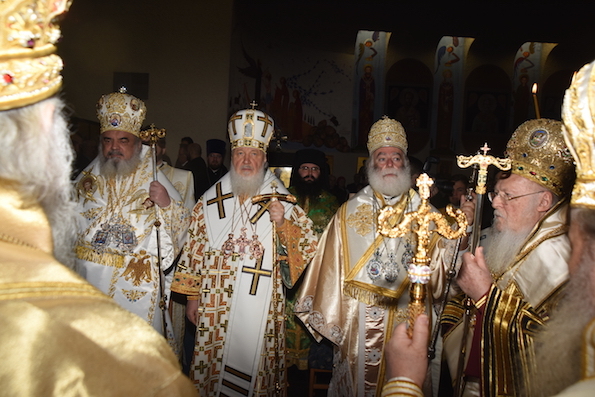 At stake is whether or not an even grander Orthodox meeting (the most important for centuries, in some people’s view) can proceed as planned this summer. The key players in this drama are Bartholomew I, the Istanbul-based Ecumenical Patriarch who is considered “first among equals” in the Orthodox hierarchy and Patriarch Kirill of Moscow. Since Ottoman and Tsarist times, these two centres of power have often competed for influence over the eastern Christian world. The very fact that Moscow agreed in principle to this summer’s “Great and Holy Synod” marks something of a diplomatic success for Patriarch Bartholomew, as does Patriarch Kirill’s presence at the current session in Geneva. He could have sent an underling. But many things are up in the air, including the location of the summer gathering: originally scheduled to take place in Istanbul, it might be relocated (perhaps to Geneva again) because of the dire state of Russo-Turkish relations. On arrival in the Swiss city, Patriarch Kirill made a carefully calibrated address that seemingly spelled out Moscow’s conditions for continued participation. The most important concern Ukraine. In that country the two biggest Orthodox institutions are the globally recognised Ukrainian Orthodox Church, ultimately under the Moscow Patriarchate, and the 25-year-old Kiev Patriarchate which strongly supports Ukrainian independence and the government’s battle against Russophile rebels in east. These two bodies have identical services; the main difference is that they pray for, and obey, different bishops. Many a confused believer could hardly tell the difference. To outsiders, it’s remarkable that thousands of local parishes across Ukraine, including some of the country’s grandest places of worship, have managed to remain at least loosely under Moscow’s ecclesiastical jurisdiction, even as war raged between the Ukrainian army and rebels who enjoyed support in high Muscovite places. As part of a survival strategy, the head of the UOC, Metropolitan Onufry, quietly excused his parishes from praying publicly for the Moscow Patriarch if they were located in areas where anti-Russian sentiment was running high. The Russian prelate complained that certain bishops, claiming to be acting under Patriarch Bartholomew’s authority, had visited Ukraine and expressed their support for the Kiev hierarchy, hence creating “temptations” among the believers and clergy of Ukraine. Patriarch Kirill welcomed the fact that many of the world’s Orthodox churches had come out in clear support of Moscow’s position. His subliminal message was something like: don’t even think about offering succour or recognition to the Kiev hierarchy, or all further inter-Orthodox cooperation will be cancelled until further notice. Religion-watchers saw the Russian Patriarch's warning as directed, above all, at Patriarch Bartholomew. There are many Ukrainians, in the homeland and the diaspora who dream of their country having a united Orthodox church which would look politically to Kiev and ecclesiastically to the ancient see of Constantinople, in other words to Patriarch Bartholomew. During a visit to Ukraine in 2008, Patriarch Bartholomew held a delicate balance, accepting the legality of the Moscow Patriarchate's authority in that part of the world but also giving heart to the Ukrainian yearning for a united, independent church. Patriarch Kirill was making it clear that if this happens, there could be a massive split within global Orthodoxy. Amid all these squabbles, there is something mysterious about any gathering of mitred, bearded prelates from different corners of the world. The services over which these gentlemen habitually preside are immensely intricate pieces of choreography; there is a great variety of languages and singing styles from booming Slavic to ululating Arabic. Yet they and their respective entourages can come together and worship, as they did this morning, in a Swiss city, the cradle of Protestantism as it happens, as though they had been concelebrating (to use the technical term) every day of their lives.